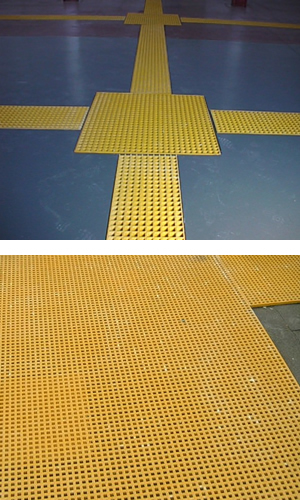 Grating sheets are available with a concave surface finish for light foot traffic areas such as walkways, workstations and platforms as well as a gritted surface finish for heavy industrial applications. TreadSafe® GRP grating has a Class 1 flame spread rating of 25 or less and is tested in accordance with ASTM E-84 Tunnel Test. Standard sheet sizes are 3660 x 1220mm, 3010 x 996mm, 1985 x 996mm with 25mm or 38mm thickness. Options include 50mm thickness. Colour choices are green and grey. Any BS or RAL colour is available subject to minimum order quantities.